Supplier of radar display, tracking and recording sub-systems, Cambridge Pixel, has announced the HPx-346, a compact, low-power (less than 5W), standalone primary radar input and network distribution card. The HPx-346 is designed to convert analogue radar signals into a standard open network data stream such as ASTERIX CAT-240. 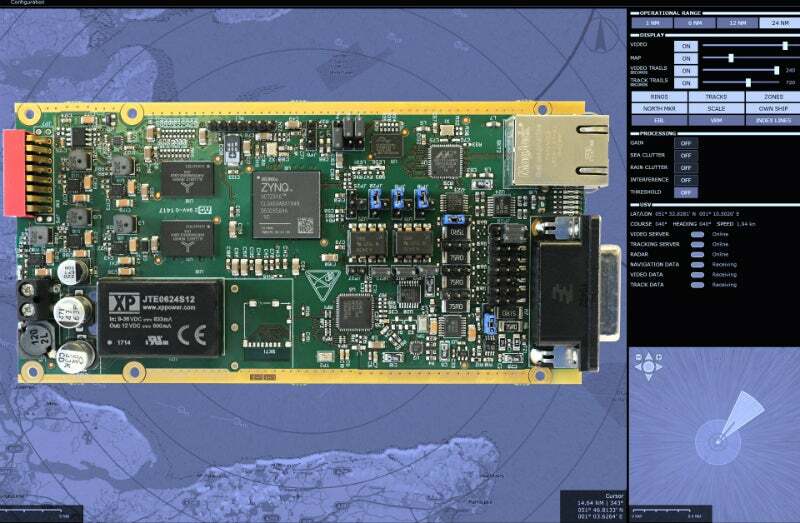 The card provides a cost-effective way of importing analogue radar data into a modern display. The small form factor (149x74mm) HPx-346 card features a combined ARM / FPGA system-on-chip processor to handle the radar acquisition and data conversion. The card may be configured through a web interface with settings made to the card for autonomous operation. Alternatively, a programming API is available to permit remote control and set-up. Cambridge Pixel CEO David Johnson said: "We have seen a number of applications that require a compact, low-power, standalone unit capable of converting radar signals into network data. For example, the HPx-346 would enable existing radars on a ship or commercial boat to be accessible in an ECDIS (electronic chart display and information systems) display. "The HPx-346 complements our existing range of HPx PCI and PCI Express radar input cards, and gives system integrators a choice between the small size and low power of the HPx-346 and a full PC-based radar server incorporating our HPx-200 or HPx-400e series cards." The HPx-346 supports a wide variety of signal types and input voltages, including differential and single-ended signals with selectable signal levels and input impedances. This allows connection to a diverse range of commercial and military radar types such as those from Furuno, JRC, Kelvin Hughes, Koden, Raytheon, Sperry, and Terma. The HPx-346 accepts radar video, trigger and azimuth signals in the form of ACP / ARP. The HPx-346 can be configured as a standalone radar processor with the card installed within existing equipment, or supplied in a compact enclosure. A development kit is available comprising the card, power supply, RadarView Software and a software development library. Cambridge Pixel’s HPx-346 is part of a family of radar acquisition and processing components that provide system integrators with a powerful toolkit to build server and client display systems. The company’s world-leading SPx suite of software libraries and applications provide highly flexible, ready-to-run software products or ‘modules-of-expertise’ for radar visualisation, radar video distribution, plot extraction, and target tracking. Cambridge Pixel’s radar technology is used in naval, air traffic control, vessel traffic, commercial shipping, security, surveillance, and airborne radar applications. Its systems have been implemented in mission-critical applications with companies such as BAE Systems, Frontier Electronic Systems, Lockheed Martin, Barco Defence, Blighter Surveillance Systems, Exelis, Kelvin Hughes, Navtech Radar, Raytheon, Royal Thai Air Force, Saab, Hanwha, Sofresud, and Tellumat. Cambridge Pixel will be showcasing its HPx-346 card and other products on stand S4-352 (South hall) at the DSEI Defence and Security show in London, UK, between 12-15 September.